Loudoun County is a dynamic and fast-growing county. As its population and businesses grow, so does the demand for safe, clean drinking water. By 2040, Loudoun Water's customers may require up to 90 million gallons of drinking water every day. This represents a 40 million gallon per day increase from today's customer demand. To meet our customers' needs, we've developed the Potomac Water Supply Program to sustainably expand our water supply capacity and protect local quality of life for generations to come. Conducting outreach activities to customers, community organizations and local government leaders. Developing new transmission capacity to distribute safe, clean drinking water to customers. As the primary stewards of water in our community, we are working hard to ensure a sustainable and reliable drinking water supply far into the future. We are committed to responsibly executing the Potomac Water Supply Program to minimize impacts to the Potomac River and to limit land disturbance. Our innovative approach to increasing water storage capacity-water banking-will give Loudoun Water the flexibility to suspend withdrawals from the Potomac River during periods of drought or during water supply emergencies. This flexibility of operation protects the Potomac River and its delicate ecosystem. In fact, the entire Program is being developed with an eye toward sustainability and minimizing community impact during construction and operation. Loudoun Water's Potomac River Water Intake leverages state-of-the-art technology and a hydraulically-modeled operating system to sustainably secure Loudoun County's water supply for generations. The Intake system is designed with the capability to withdraw river water at the right level and at the right time. The system is designed to be adaptive to the stresses and health of the Potomac River, and will be operated to minimize impacts on the Potomac River and the ecosystem it supports. The Pumping Station design integrates aesthetics and functionality. We've ensured that the Pumping Station complements the landscape and is architecturally compatible with the adjacent community. It's also remarkably quiet due to the sound-attenuating chimneys, and it's completely odorless. In operation, the Pumping Station will have a back-up generator to ensure that your water service is safe and reliable even in the event of a power outage. Loudoun Water is dedicated to the most cost-effective and sustainable solution for laying transmission pipelines. As such, the pipelines will follow existing utility corridors. This minimizes costs, as well as impacts to communities and the natural environment. In addition to using the existing utility corridors, the pipelines are designed to serve future demand. The capacity of the pipelines allows for phased growth and is aligned with the needs of a growing community. To extend the life of the pipelines for future generations, the Raw and Drinking Water Transmission Pipes are manufactured with an innovative corrosion protection coating. This cutting-edge material provides customer value by giving our pipelines extreme longevity. Loudoun Water is proud to be the regional leader in raw water storage, ensuring that your water supply will be safe and secure in the event of a drought or other water supply emergency. This pioneering approach to water supply management-storing water in a retired rock quarry-will initially allow Loudoun Water to store at least one billion gallons of water. 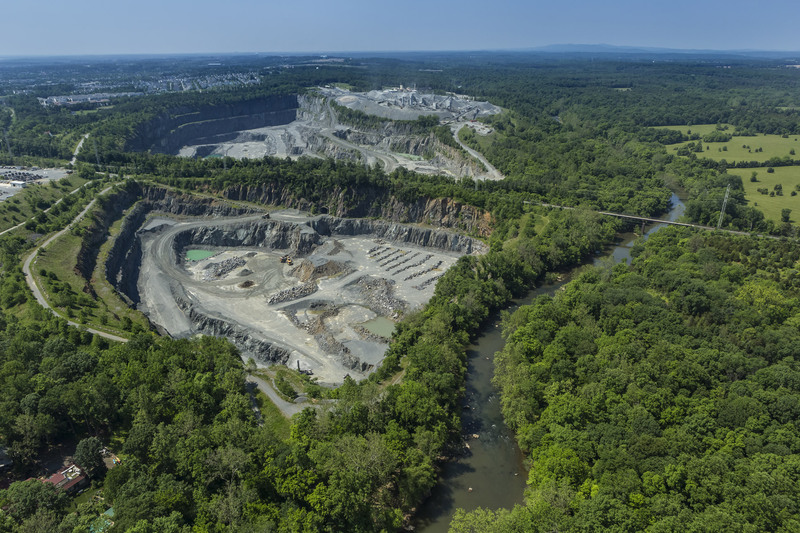 As additional quarries are acquired, Loudoun Water will be able to store more than 8 billion gallons of water in quarries. The water storage system protects your water supply, and it also protects the Potomac River. Because the system proactively withdraws and stores river water during normal flow, we will suspend direct water withdraws from the Potomac River during water supply emergencies. During water supply emergencies we'll use banked water from the quarry, not water from the Potomac River, as source water for the drinking water treatment process. In this way, water banking offers treatment flexibility and climate resiliency so we can more reliably serve you with safe, clean drinking water whenever you need it. Loudoun Water is proud to partner with Luck Stone..Luck Stone is a core business unit of Luck Companies, a privately-owned family business based in Richmond, Virginia. Luck Companies and Loudoun Water share a vision of long-term sustainability and hold commitment to local community as a core value. Our shared vision and common values provided a foundation for doing business together and helped develop our long-term partnership for water storage. Loudoun Water's secure, state-of-the-art Trap Rock Water Treatment Facility is designed to meet or exceed drinking water regulations to ensure that you have the highest quality drinking water available today - and for years to come. We designed Trap Rock Water Treatment Facility to be expandable and the processes scalable to meet the future demand of our constantly growing community. Beyond providing safe, clean drinking water, the Trap Rock Water Treatment Facility features attractive architecture and will be constructed using low-impact development principles. We're using the most sustainable materials, technologies and management practices to design the administration building of Trap Rock Water Treatment Facility for LEED certification. We are taking an overall low-impact development approach to building and construction by utilizing recycled building materials, establishing rain gardens to capture stormwater, and by incorporating an ultra-efficient HVAC system. The Potomac Water Supply Program will position Loudoun Water to play an increasingly important role in the collaborative relationships of the region's water utilities. The Potomac River is the primary source of drinking water for this region. With multiple jurisdictions serving their customers, collaboration and coordination are critical to the long-term sustainability of the natural resource. As a leading regional utility, we take our role and responsibility in regional water supply planning very seriously. We are committed to an approach that will serve the region's customers and the long-term viability of the Potomac River. Watch the Potomac Water Supply Program Video! For detailed information about projects listed on this map, visit our Current Projects page.